There isn't much point to having a recap episode in a 12-episode series. There's even LESS point to it when each episode is only 12 minutes long. And there's virtually NO point when the vast majority of the series focuses on a girl getting her blood sucked by a handful of vampires. Not enough happens in the first six episodes of Diabolik Lovers for this recap to be even remotely useful. All this recap really did was showcase all the times Yui has been accosted by the Sakamaki brothers. There has literally been 10% plot and 90% blood sucking in this anime (and saying that it has 10% plot is probably being generous). So there really isn't anything for this recap to cover other than blood sucking. The only reason to watch this is if you enjoy watching a girl be attacked, molested, and used against her will by five brother vampires. 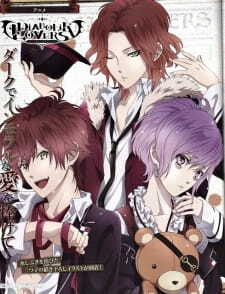 There are tons of anime out there that could have done with a recap episode but Diabolik Lovers was most certainly not one of them. For a start, episodes are only 15 minutes long and the series overall is just 12 episodes. Anyone who has seen the first 6 episodes of Diabolik Lovers would know that nothing worth recapping occurs. This recap is just an excuse to create a montage of the bland protagonist Yui being bitten by the sadistic Sakamaki brothers. It's basically the so called 'best bits' aka the disturbing bits of the first 6 episodes. I would not say it does a great job at recapping but it isn't terrible as it is coherent. I mean, this is episode "6.5" apparently, which I don't understand at all. Why do six episodes need a recap? On top of that, this honestly resembled a YouTube video--- it was a compilation of every single time Yui had her blood sucked up until episode 7, with some extra lines about her dead mother and a closing sentence thrown in. If I had to describe this in one word, I would say 'useless'. There isn't anything else I can write about this, if I'm being honest. That being said, have a great day!